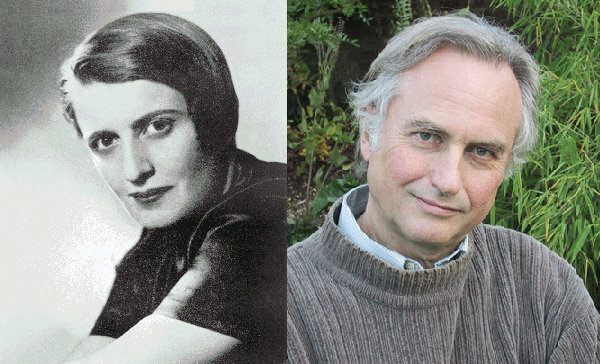 One of Ayn Rand’s better essays is called The Argument From Intimidation. There is a certain type of argument which, in fact, is not an argument, but a means of forestalling debate and extorting an opponent’s agreement with one’s undiscussed notions. It is a method of bypassing logic by means of psychological pressure. It consists of threatening to impeach an opponent’s character by means of his position, thus impeaching the position without debate. Example: “Anyone who would question that the perpetrator of mass murder on American soil didn’t deserve what he got needs to have their head examined.” The falsehood of the position is asserted arbitrarily and offered as proof of the opponent’s immorality. You can read the whole thing (minus “Goblian interpolations”) here. But I’ve given you the gist of it. I’m currently reading The Greatest Show on Earth: the Evidence for Evolution by Richard Dawkins. I’ve just finished reading Chapter One and, so far, Dawkins has not presented one jot of evidence. Not even a skerrick. In lieu of evidence, Dawkins commits the logical fallacy that Rand identified and dubbed the Argument from Intimidation. Not just once, but … umpteen times. Imagine you are a teacher of more recent history, and your lessons on twentieth-century Europe are boycotted, heckled or otherwise disrupted by well-organized, well-financed and politically muscular groups of Holocaust-deniers. … Holocaust-deniers … are vocal, superficially plausible, and adept at seeming learned. They are supported by the president of at least one currently powerful state, and they include at least one bishop of the Roman Catholic Church. Imagine that, as a teacher of European history, you are continually faced with belligerent demands to ‘teach the controversy’, and to give ‘equal time’ to the ‘alternative theory’ that the Holocaust never happened but was invented by a bunch of Zionist fabricators. Fashionably relativist intellectuals chime in to insist that there is no absolute truth: whether the Holocaust happened is a matter of personal belief; all points of view are equally valid and should be equally ‘respected’. The plight of many science teachers today is not less dire. When they attempt to expound the central and guiding principle of biology; when they honestly place the living world in its historical context – which means evolution; when they explore and explain the very nature of life itself, they are harried and stymied, hassled and bullied, even threatened with loss of their jobs. At the very least their time is wasted at every turn. They are likely to receive menacing letters from parents, and have to endure the sarcastic smirks and close-folded arms of brainwashed children. They are supplied with state-approved textbooks that have had the word ‘evolution’ systematically expunged, or bowdlerized into ‘change over time’. Once, we were tempted to laugh this kind of thing off as a peculiarly American phenomenon. Teachers in Britain and Europe now face the same problems, partly because of American influence, but more significantly because of the growing Islamic presence in the classroom – abetted by the official commitment to ‘multiculturalism’ and the terror of being thought racist. … and blames Muslims, multiculturalists and their pusillanimous appeasers for resistance to his ideas in the classroom. Nowadays there is nothing to debate. Evolution is a fact and, from a Christian perspective, one of the greatest of God’s works. We write as a group of scientists and Bishops to express our concern about the teaching of science in the Emmanuel City Technology College in Gateshead. Evolution is a scientific theory of great explanatory power, able to account for a wide range of phenomena in a number of disciplines. It can be refined, confirmed and even radically altered by attention to evidence. It is not, as spokesmen for the college maintain, a ‘faith position’ in the same category as the biblical account of creation which has a different function and purpose. The issue goes wider than what is currently being taught in one college. There is a growing anxiety about what will be taught and how it will be taught in the new generation of proposed faith schools. We believe that the curricula in such schools, as well as that of Emmanuel City Technology College, need to be strictly monitored in order that the respective disciplines of science and religious studies are properly respected. Note how the authors, chillingly, want school curricula to be “strictly monitored” for conformance to doctrines approved by Dawkins. Here are some further excerpts from the remainder of Chapter One. I’ve bolded some words to identify the numerous occasions on which Dawkins resorts to Rand’s Argument from Intimidation and his also numerous (and as yet unargued for) assertions that evolution is a fact. More than 40 per cent of Americans deny that humans evolved from other animals, and think that we – and by implication all of life – were created by God within the last 10,000 years. … I shall be using the name ‘history-deniers‘ for those people who deny evolution: who believe the world’s age is measured in thousands of years rather than thousands of millions of years, and who believe humans walked with dinosaurs. … they constitute more than 40 per cent of the American population. … I shall from time to time refer to the history-deniers as the ‘40-percenters‘. To return to the enlightened bishops and theologians, it would be nice if they’d put a bit more effort into combating the anti-scientific nonsense that they deplore. All too many preachers, while agreeing that evolution is true and Adam and Eve never existed, will then blithely go into the pulpit and make some moral or theological point about Adam and Eve in their sermons without once mentioning that, of course, Adam and Eve never actually existed! If challenged, they will protest that they intended a purely ‘symbolic’ meaning, perhaps something to do with ‘original sin’, or the virtues of innocence. They may add witheringly that, obviously, nobody would be so foolish as to take their words literally. But do their congregations know that? How is the person in the pew, or on the prayer-mat, supposed to know which bits of scripture to take literally, which symbolically? Is it really so easy for an uneducated churchgoer to guess? In all too many cases the answer is clearly no, and anybody could be forgiven for feeling confused. The history-deniers themselves are among those that I am trying to reach in this book. But, perhaps more importantly, I aspire to arm those who are not history-deniers but know some – perhaps members of their own family or church – and find themselves inadequately prepared to argue the case. Evolution is a fact. Beyond reasonable doubt, beyond serious doubt, beyond sane, informed, intelligent doubt, beyond doubt evolution is a fact. …Evolution is a fact, and this book will demonstrate it. No reputable scientist disputes it, and no unbiased reader will close the book doubting it. Why, then, do we speak of ‘Darwin’s theory of evolution’, thereby, it seems, giving spurious comfort to those of a creationist persuasion – the history-deniers, the 40-percenters – who think the word ‘theory’ is a concession, handing them some kind of gift or victory? Even the undisputed theory that the moon is smaller than the sun cannot, to the satisfaction of a certain kind of philosopher, be proved … But massive accretions of evidence support it so strongly that to deny it the status of ‘fact’ seems ridiculous to all but pedants. The same is true of evolution. A scientific theorum has not been – cannot be – proved in the way a mathematical theorem is proved. But common sense treats it as a fact in the same sense as the ‘theory’ that the Earth is round and not flat is a fact, and the theory that green plants obtain energy from the sun is a fact. All are scientific theorums: supported by massive quantities of evidence, accepted by all informed observers, undisputed facts in the ordinary sense of the word. This book will take inference seriously – not mere inference but proper scientific inference – and I shall show the irrefragable power of the inference that evolution is a fact. The slow drifting apart of South America and Africa is now an established fact in the ordinary language sense of ‘fact’, and so is our common ancestry with porcupines and pomegranates. Our present beliefs about many things may be disproved, but we can with complete confidence make a list of certain facts that will never be disproved. Evolution and the heliocentric theory weren’t always among them, but they are now. Biologists often make a distinction between the fact of evolution (all living things are cousins), and the theory of what drives it (they usually mean natural selection, and they may contrast it with rival theories such as Lamarck’s theory of ‘use and disuse’ and the ‘inheritance of acquired characteristics’). But Darwin himself thought of both as theories in the tentative, hypothetical, conjectural sense. This was because, in those days, the available evidence was less compelling and it was still possible for reputable scientists to dispute both evolution and natural selection. Nowadays it is no longer possible to dispute the fact of evolution itself – it has graduated to become a theorum or obviously supported fact – but it could still (just) be doubted that natural selection is its major driving force. By the time Darwin came to publish On the Origin of Species in 1859, he had amassed enough evidence to propel evolution itself, though still not natural selection, a long way towards the status of fact. Indeed, it was this elevation from hypothesis towards fact that occupied Darwin for most of his great book. The elevation has continued until, today, there is no longer a doubt in any serious mind, and scientists speak, at least informally, of the fact of evolution. All reputable biologists go on to agree that natural selection is one of its most important driving forces, although – as some biologists insist more than others – not the only one. Even if it is not the only one, I have yet to meet a serious biologist who can point to an alternative to natural selection as a driving force of adaptive evolution – evolution towards positive improvement. I’m now half of the way through Chapter Two. It’s a big improvement on Chapter One, but there’s still no evidence for evolution in sight … stay tuned. I just skim-read parts of TGSOE as I was put off it for reasons similar to yours. If you want a short, lucid, fact-packed defence of evolution, Jerry Coyne’s Why Evolution is True is good, but I probably didn’t do justice to TGSOE.